The Lord’s Day is traditionally a day of rest for the Amish. Closing up shop for the day is a way of honoring God. Generally Amish do not transact any sort of business on Sunday, including selling products or making their own purchases. Amish are very active in woodworking (including all types of furniture making), construction (both residential and commercial), and manufacturing. Small shops are common, including dry goods stores, bulk foods stores, and quilt and crafts shops. In some settlements, food stands are popular. Some Amish run specialty shops and services, such as shoe repair, taxidermists, plain clothing dealers, machinery and small engine repair, and more. Pennsylvania Dutch markets including a number of different Amish-run businesses are found in major East Coast cities such as Philadelphia, Baltimore and Washington, D.C. Read more. They are often advertised by modest roadside signs in Amish areas. Some can be found online as well, on local websites such as tourist board or chamber of commerce sites. 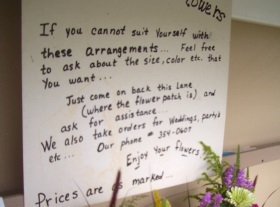 Sign at a roadside flower stand, Lancaster County. Amish publications such as The Budget, Plain Communities Business Exchange, and others are another source of information, as are local community business directories, such as the Holmes County business directory, or Lancaster County Business Directory, covering two of the largest communities. You can also search Amish-owned businesses and businesses that sell Amish products in our online Amish business directory. Why have so many Amish opened businesses in recent years? Three main reasons: farms have gotten more expensive, the Amish population has kept growing (making farms harder to purchase), and businesses have a lower start-up cost than dairy farming. Some Amish entrepreneurs are second- and third-generation businesspeople. Recent conservative estimates have the number at 9-10,000. The actual number can be challenging to gauge since some small sideline businesses, such as part-time baking or at-home seamstress work, may have few visible signs to outsiders. Do Amish make a lot of money? Are they rich? Some Amish do earn a large income, and may be quite wealthy. Amish millionaires do exist. These are usually the business people in Amish society. Some Amish farmers may possess very valuable land holdings, due to the increase in real estate values in some Amish communities. However, they typically have a more limited cash flow and income. Regarding income, the same holds true for day laborers, a third common occupational classification among the Amish. Many Amish women do run their own enterprises. These may be small roadside stands, sewing or quilting sidelines, baking businesses, or even full-time operations such as food stands, variety stores, or stamp shops. Amish women make valuable contributions to their households’ bottom line thanks to their business activity. Amish hold many types of auctions, including benefit auctions for medical bills or Amish-supported clinics, school auctions for maintenance of a schoolhouse, single-family moving auctions, estate auctions, all types of commercial auctions including quilt auctions, horse and livestock auctions, and others. Some Amishmen work as auctioneers as a full- or part-time occupation. 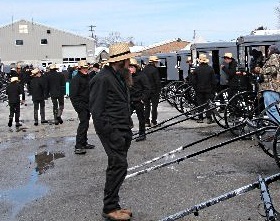 More on the different types of Amish auctions. Yes, Amish have to pay taxes. They pay income tax, sales tax, property tax, school taxes, and other local taxes. Most Amish are exempt from Social Security taxes, however, as they view Social Security as an insurance program, and have negotiated an exemption. Consequently, they do not collect Social Security benefits. This Social Security exemption may not apply in the case of Amish working for non-Amish employers. Kraybill, Donald B., Steven M. Nolt, and Erik J. Wesner, “Sources of Enterprise Success in Amish Communities.” Journal of Enterprising Communities: People and Places in the Global Economy 5.2 (2011): 112-130. Kraybill, Donald B., Steven M. Nolt, and Erik J. Wesner, “Amish Enterprise: The Collective Power of Ethnic Entrepreneurship.” Global Business and Economics Review 12.1/2 (2010): 3-20. Harasta, Joseph. “The Amish—A People of Preservation and Profitability: A Look at the Amish Industry in Lancaster County, Pennsylvania.” Journal of Amish and Plain Anabaptist Studies 2.1 (2014): 23-41. Web. To Cite this Page: Wesner, Erik J. “Business.” Amish America. Erik Wesner, 24 Jan. 2015. Web. [Date Accessed]. <http://amishamerica.com/business/>. Image credit: Bart Mud Sale- Ed C.
I am studying second high school in Barcelona and I am doing my final research proyect on the success of the Amish businesses. Also, I have read your book “Success Made Simple” that is helping me a lot to understand how they work. I am writing because it would be very important to me that you could answer a few questions, they will not take up much more than 5 minutes and it will be very useful to raise my qualification. Hope you will answer before next month begins. 1.- First of all, what leads you to get interested in the Amish community? 2.- What was your main purpose in writing this book and what kind of readers do you recommend it to? 3.- It was easy to interview Amish entrepreneurs? They put any condition? 4.- Do you think their way of doing business would succeed in Europe at this time? 5.- In your opinion which you think are the three main keys to success in Amish business? 6.- What most surprised you during this time? 7.- And finally, are you planning to do other things related with economy? My company has purchased products from Shrock’s harness shop in Indiana. Can they fill out a W9 for us? Will they have an EIN? I would like to pay the invoice but accounting is giving me a hard time. Hey Susan, I would just contact them directly, if you have a number. They should be able to handle that for you. 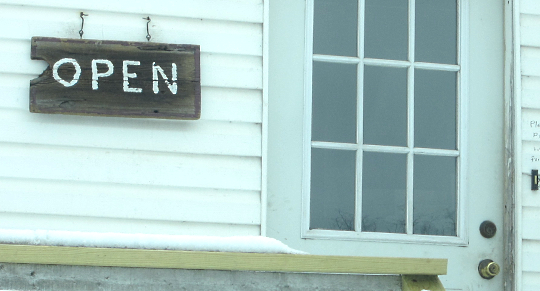 Usually if no one answers at Amish businesses, just leave a message, they’ll get back in touch.